Anesthesiologist Calls Ohio Execution "Inhumane"
The lethal injection of Dennis McGuire in Ohio in January "was not a humane execution," according to Dr. Kent Dively (pictured), a San Diego anesthesiologist who examined records related to the execution, which took nearly 30 minutes to complete. Dr. Dively made the statement in an affidavit related to a civil rights suit filed by McGuire's children. McGuire was the first person in the country to be executed using a combination of midazolam and hydromorphone. Dively stated, "Neither of these drugs combined in the doses used can be depended upon to produce a rapid loss of consciousness and death." He continued, "Mr. McGuire was noted to be straining against his restraints, struggling to breathe, and making hand gestures. More likely than not these represent conscious voluntary actions by Mr. McGuire. They exemplify true pain and suffering in the several minutes before he lost consciousness." He also noted that Ohio's execution protocol states that all executions will be carried out in a "professional, humane, sensitive, and dignified manner," and said the state failed to meet its own standards: "These drugs do not fulfill the criteria set forth by the state of Ohio. They do not provide for an execution in a professional, humane, sensitive, and dignified manner. Allowing the inmate to suffer for a prolonged period struggling to get free and gasping for air before death certainly is not dignified nor humane." He recommended the state "reconsider the drug combinations they are currently employing. Otherwise other inmates in the future could suffer egregious inhumane deaths like Mr. McGuire." 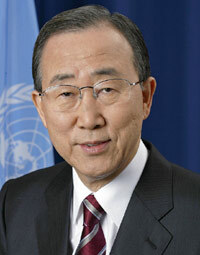 United Nations Secretary-General Ban Ki-Moon recently called on all nations to take concrete steps toward ending the death penalty. In his opening remarks at an event co-sponsored by the High Commissioner for Human Rights, Mr. Ban said, "Together, we can finally end this cruel and inhumane practice everywhere around the world." He noted that "more than four out of five countries — an estimated 160 Member States — have either abolished the death penalty or do not practice it." He encouraged support for the UN General Assembly's resolution, first adopted in 2007, supporting a moratorium on the death penalty with a view toward abolishing it. Each time the resolution is renewed, its margin of support has grown. Ban also called on member states to ratify the Second Optional Protocol of the International Covenant on Civil and Political Rights, aiming at ending capital punishment. "Because Taylor seeks to determine whether the drug to be used in his execution will result in pain or in a lingering death, it bears repeating the importance of the identities of the pharmacists, laboratories, and drug suppliers in determining whether Missouri's execution of death row inmates is constitutional." "[F]rom the absolute dearth of information Missouri has disclosed to this court, the 'pharmacy' on which Missouri relies could be nothing more than a high school chemistry class." "If through lack of experience or lack of time to do adequate testing, the pharmacy has manufactured something which is quite painful, Taylor's constitutional rights would be violated." "Missouri has a storied history of ignoring death row inmates' constitutional rights to federal review of their executions. I once again fear Missouri elevates the ends over the means in its rush to execute Taylor." On January 7, the Boston Bar Association, representing more than 10,000 lawyers, released a statement opposing the use of the federal death penalty. The Association already had a longstanding position against the death penalty in state cases. Paul T. Dacier (pictured), the President of the Boston Bar, said, "Without equivocation, the death penalty has no place in the fair administration of justice and makes no sense on a practical level." The organization's new stance was based on a review of the death penalty by a working group chaired by retired Superior Court Judge Margaret Hinkle and Martin Murphy, a partner at Foley Hoag LLP. Murphy said, "The research we conducted confirms that death penalty prosecutions, including federal death penalty cases, are more expensive and time consuming, more subject to prolonged delays, and unlikely to produce a different result than where the prosecution seeks life without parole." The study also raised concerns about the "inevitability of error" in criminal cases.